I signed up for the Target Summer Beauty bag this time around, and I admit, it was pretty awesome. But to me the big win was discovering Aveeno smart essentials daily scrub. It is probably the best facial scrub that my 43 year old face has run into in years. I raved about it on plurk when it came out. So imagine my chagrin when, after having taken it to New York with me that I couldn't FIND it when I returned home. At first I thought that I had left it in the suitcase I carelessly left unpacked for about two weeks. But then I finally got around to unpacking it and going through my sundry chick bags of this and that to no avail. NO AVEENO CLEANSER. This was about the time that my husband pointed out the sticker on my suitcase, saying the TSA had opened and inspected my bag. Those jacks at the TSA who were TOO LAZY TO SIGN UP FOR THE TARGET SUMMER BEAUTY BAG STOLE MY CLEANSER. What a bunch of jerkwads. That's fine. I will buy more. TAKE my cleanser you ne'er do well. AND MAY YOU NEVER HAVE A DAY'S LUCK WITH IT! 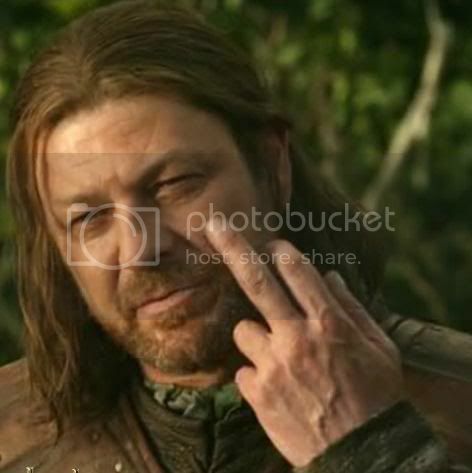 I've asked Eddard Stark to convey my feelings on this.